Carpet cleaning comes in many shapes and sizes. From a bit of local spot removal to hiring a machine at Bunnings. 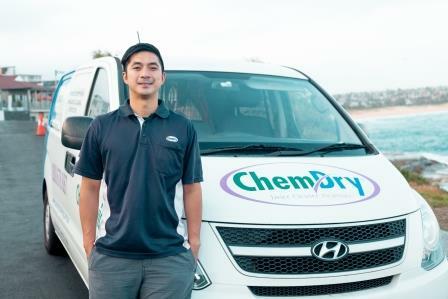 Chem-Dry Clean Dry has been supplying Sydney with premium carpet restoration and sanitisation services for the last decade. Why is Regular Carpet Maintenance so Important? External factors. Many of us will carry bacteria and dirt in from the street or garden. Pets and kids. Your home is a place of activity. It can get a bit hectic at times. Carpets get dirty in the process. Lifestyle choices. Sometimes you might just feel like relaxing in front of the television after a long day at work. Allergy prevention. Bacteria and Dust Mite activity make life difficult for allergy suffers. Clean hygienic carpets will go some way to providing a healthier home. Fast Drying Cleaning Solutions. Our carpets are dry within one to two hours. You will be delighted with our rapid drying cleaning results. Lab Tested Cleaning Solutions. Not many companies place so much emphasis on eco-friendly carpet cleaning. Chem-Dry spends millions of dollars each year to make sure our cleaning complies our green reputation. Great Local Service. We have technicians all over Sydney just waiting to give you quality friendly service. Our staff love helping customers with free advice and quotations. 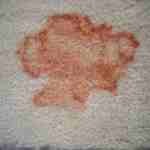 Specialised Stain Removal. Chem-Dry has the art of problem-solving down to a tee. Special cleaning chemicals for the more complicated stains is just part of our approach. Your carpets get a lot of use, spills are inevitable. Over time, the factory-applied stain resistant becomes less effective and fades away leaving your carpets susceptible to staining. ChemDry CleanDry Protectants refreshes the performance of stain resistant carpets, creating a barrier around the carpet fibres to resist soiling and staining by allowing spills to be removed before staining can occur. Repel Protectant- Repel Protectant works with all kinds of carpets by forming a protective shield around each carpet fibre. This liquid-repelling carpet solution doesn’t give stains the chance to set in. Wool Protectant- ChemDry CleanDry’s Wool Protectant is a water-based solution specifically designed to enhance the stain resistant qualities of wool carpets and rugs. It defends against most liquid spills to stop stains in their tracks. Does someone in your home suffer from allergies? Do you have children who love to roll around and play on the carpet? Unfortunately, carpets absorb and collect common allergens and germs that can spread illness, cause allergies and make asthma symptoms worse for you and your family. 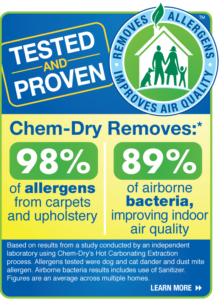 Chem-Dry Clean Dry professional strength Deodoriser and Sanitiser reduce tough odours and allergens, leaving your carpets clean and healthy and your family safer. We also clean sofas, rugs, mattresses and more! Our general cleaning company does great work with lease or exit cleaning.